We have highly acknowledged organization engaged in presenting a remarkable range of Latex Foam Bed Mattress. Printed EPE+ Foam Bed Mattresses, Thickness: 4"
We are foremost organization, actively occupied in providing a wide range of Bed Mattress. 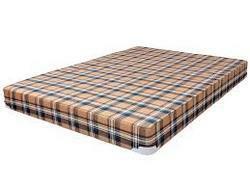 As a prominent company, we are occupied in manufacturing and supplying a wide assortment of Orthospine Foam Mattress. - Used on the beds of hotels, houses and hostels.